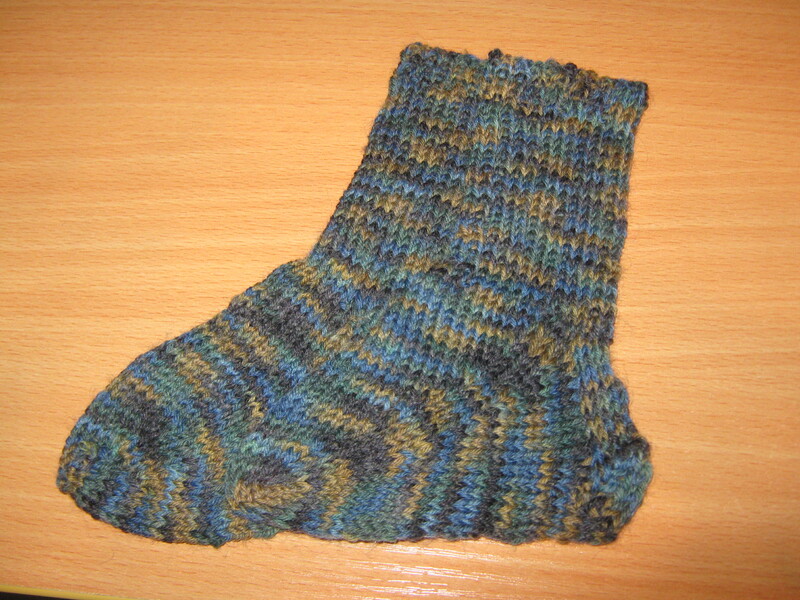 I looked around for good, friendly learner patterns, and decided on Just Plain Socks by Talena Winters. 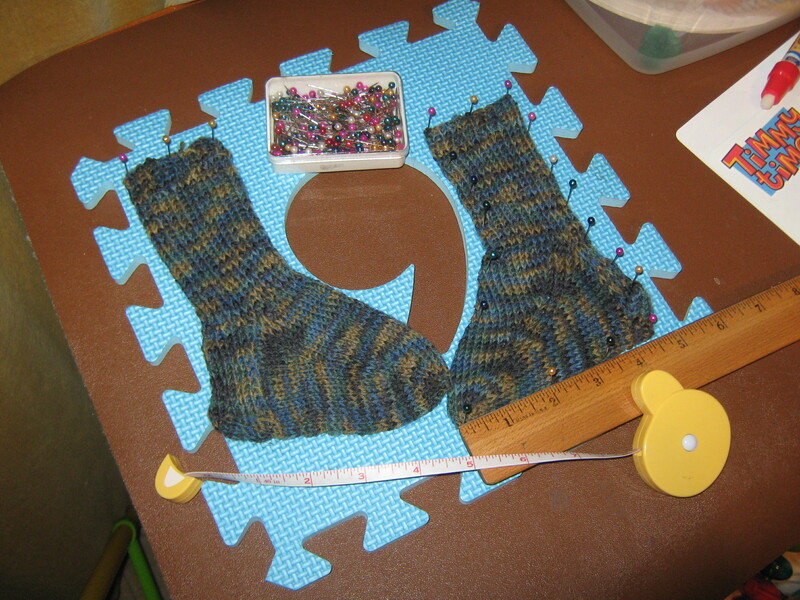 It requires being able to do basic maths… but I think most knitters would agree that one improves their basic math skills by dint of knitting, thereby making knowing the actual size in inches that you’re working less scary. Which is to say, rather than quoting actual number of stitches for each size, you need to be able to work out basic formulations. Trust me, it sounds scarier than it actually is. 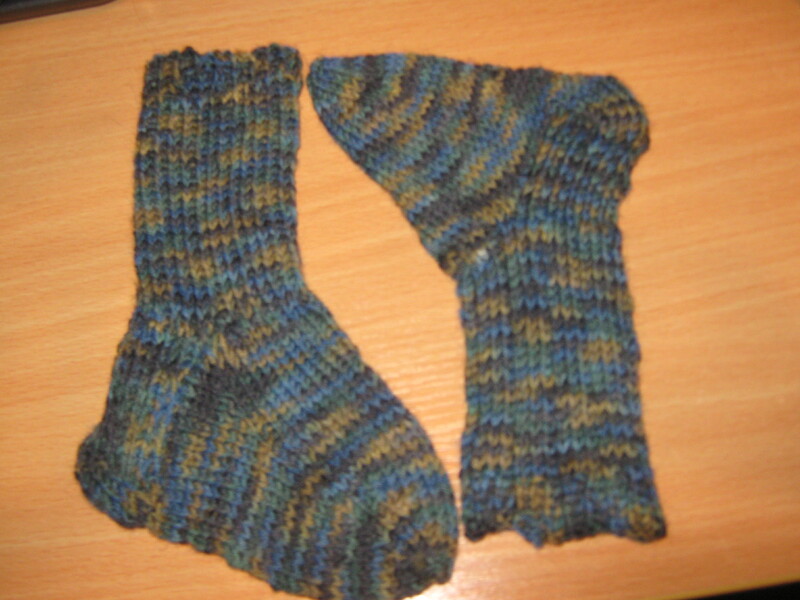 I’ll admit that I made a bit of a bodge the entire way through both of them, but as they came out sock-shaped, I wasn’t going to complain overmuch. After all, one has to make mistakes to learn how to not make them later. The mistake I didn’t expect to make was the second one coming out so much smaller than the first one! I guess my tension was tighter? I’m still new to working in the round on DPNs, so it doesn’t come as any real surprise that my tension isn’t even yet. And it gave me the chance to *gulp* wet-block for the first time. As you can see, I borrowed one of my daughter’s play tiles. I couldn’t find any that were hole-free off-hand, so thankfully, the 6/9 worked well enough for pinning up the socks after I wet them and pulled them about a bit. 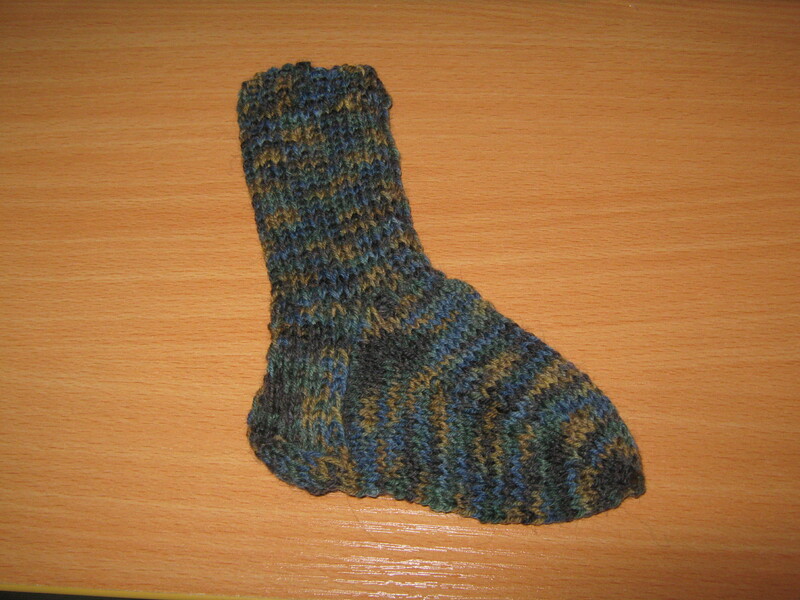 The smaller sock is still a smidge smaller, but that’s okay. 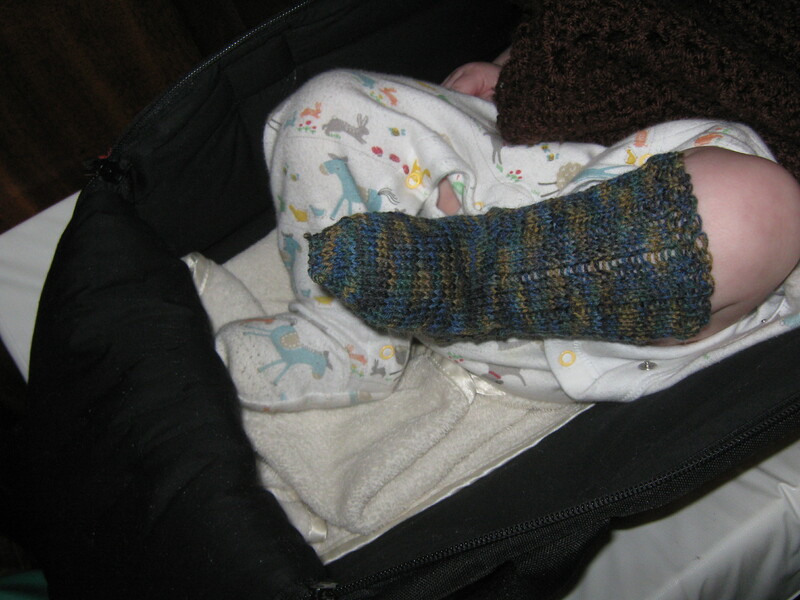 Shoving them on tiny baby feet will help with any remaining stretching needed, I reckon. The experience was relatively pain-free though, so I’m feeling more optimistic about future blocking efforts. For the moment, I return to my cardigan. 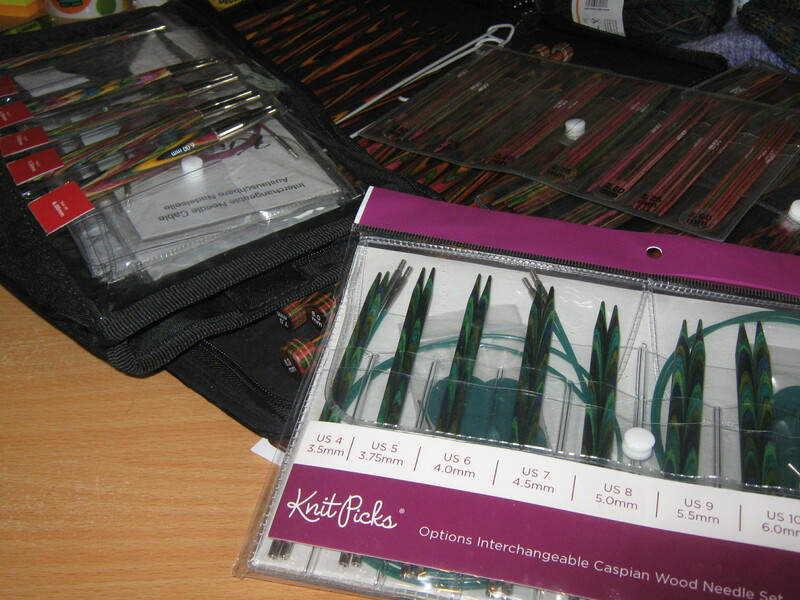 It amuses me how huge the 4mm needles feel after the 3.25mm needles! Even the wool feels like chunky after working with sock wool. Having said that, it feels nice to not have to turn after a handful of stitches, and to be working straight again. 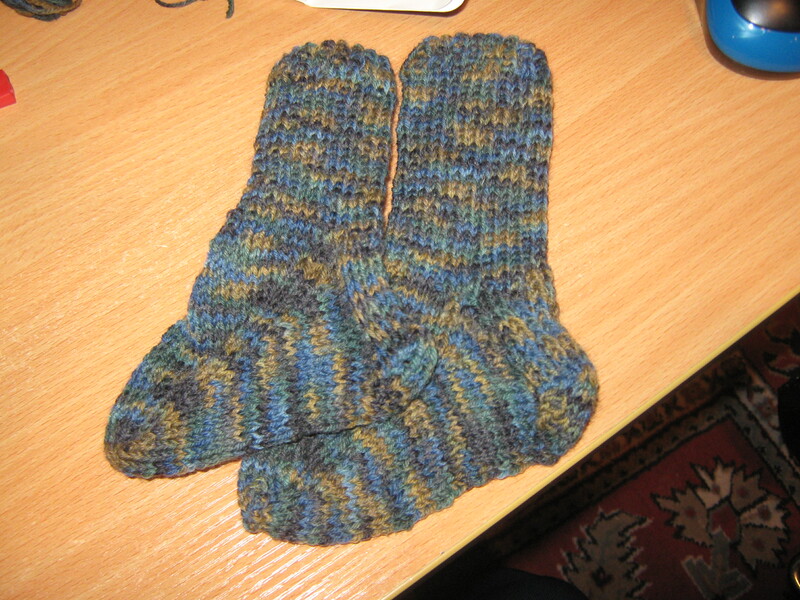 I’ll definitely do socks again, and probably this same pattern again — this time, for Lilbit, the 5 year old. 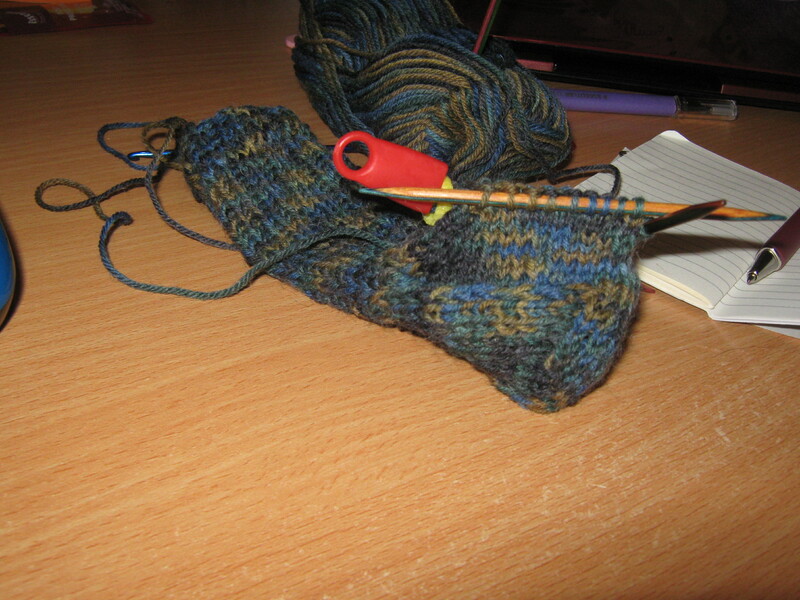 But first I need to make some sincere progress on the cardigan again. I’m slightly amused that I went from ‘one project at a time’ to ‘Oh well, I guess I can stop and do a little one’. I understand that this is a common knitter ‘woe’, but still! Past that, I’ve been trying to find what games I can manage to play without angering my desktop computer. The graphics card seems to be breaking/broken. Sometimes it works fine all day, other times it freaks out and stops working properly for a few days, complete with crashes. I tried emailing the company I bought it from to get them to take it back and fix it while it’s under warranty, but their email support team seems to be the most freaking incompetent lot of ticklist-following idiots I’ve ever come across. We’re going to call to shake ’em down… once we manage to work ourselves up to using the phone. The husband’s stutter and my severe phone-based anxiety make phone-based contact less than ideal, to say the least. But I’m still managing to get my gaming on, for great justice. I’m running one of my old favourites right now — Serf City: Life is Feudal (aka Settlers 1). I’ve also been on an Anno kick, specifically 2070 and 1404 Venice. I’ve also had a bit of Caesar III and Caesar IV. What can I say — I love city-building games. And because they’re slower real time strategy games, they go together quite well with knitting. I also acquired Final Fantasy Tactics Advance with my birthday-Christmas money, so I’ve got that loaded into my DS to give a spin to. I loved the original so much (and do have an emulator version thereof), but I do like a bit of hand-held fun still. I need to get the sequel as well eventually, yanno, for the principle of the thing. So yes, busy days indeed.